Auburn University has been designated an R1 research institution by the Carnegie Classification of Institutions of Higher Education, which highlights the university’s high level of research activity. 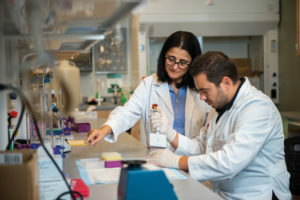 Above, Amal Kaddoumi, left, a professor in Auburn’s Department of Drug Discovery and Development, works with graduate research assistant Sweilem Al Rihani investigating oleocanthal, a molecule in extra-virgin olive oil, as a novel preventative treatment for Alzheimer’s or dementia. Atlas Senior Living has experienced rapid growth in 2018, with an 88 percent total occupancy across its 423 units. Two communities achieved 100 percent occupancy and two more maintained it for 11 of 12 months. BBB Industries, of Daphne, has partnered with TFI Envision Inc. to win a Connecticut Art Directors Club Award of Excellence and a dotCOMM Gold Award for its OE Overhaul advertising campaign and an American Graphic Design Award for its NAPA Power Premium Plus Trilingual Packaging. Faulkner University Jones School of Law was named a 2018 MGM Impact Maker by the Montgomery Area Chamber of Commerce. Interstate Billing Service has surpassed $2 billion of invoices in a single year, best in the company’s 35-year history. Interstate Billing, a subsidiary of Bank Independent, has 125 employees in Decatur. Robins & Morton has received six Excellence in Construction awards from the Associated Builders and Contractors of Alabama. In addition, the company received the Building Star Award for its work in Raleigh, North Carolina from the North Carolina Department of Labor. Staggs Grocery, a family-run eatery in Florence, won Simply Southern TV’s Bama’s Best Breakfast contest. Trustmark celebrated its 129th anniversary in December with a Month of Thanks and Week of Giving, presenting $25,000 to community organizations in its five-state area. Alabama recipients are Valiant Cross Academy, United Way of Southwest Alabama and the Birdie Thornton Center. Tuskegee University’s accreditation has been reaffirmed for 10 years. The university also ranked in the top 25 degree producers in Diverse: Issues in Higher Education’s annual ranking. Wilkins Miller has been named to the Best Accounting Firms for Women by Accounting Today for a second consecutive year. The Princeton Review’s 2019 best business schools ranking places Auburn University‘s online MBA program at no. 13 in the nation for a second consecutive year. This ranking comes on the heels of the recent Poets & Quants listing of Auburn’s Harbert College of Business as no. 2 in its ranking of Best Online MBA Programs of 2019. HudsonAlpha Institute for Biotechnology is celebrating its 10th anniversary. Under the direction of 15 faculty investigators, scientists have published more than 650 research papers, made discoveries in numerous areas, diagnosed close to 200 children with unexplained developmental delays and opened the Smith Family Clinic for Genomic Medicine, the first stand alone genomics clinic. In addition the HudsonAlpha Genome Sequencing Center has sequenced more than 110 organisms and the Genomic Sequencing Lab has processed more than 400 terabytes of raw DNA sequence each month. Southeast Health is celebrating its first year of Transcatheter Aortic Valve Replacement procedures. During this year, it has completed approximately 40 of these non-surgical valve replacement procedures. The University of Alabama at Birmingham Department of Psychology increased its federally funded research expenditures by 12 percent from 2016-2017, totaling more than $4.9 million, according to the National Science Foundation Higher Education Research and Development Survey for 2017. The United States Sports Academy‘s accreditation through the Southern Association of Colleges and Schools Commission on Colleges has been reaffirmed for another 10 years. It is America’s only freestanding accredited sports university.